Right? Well, probably. 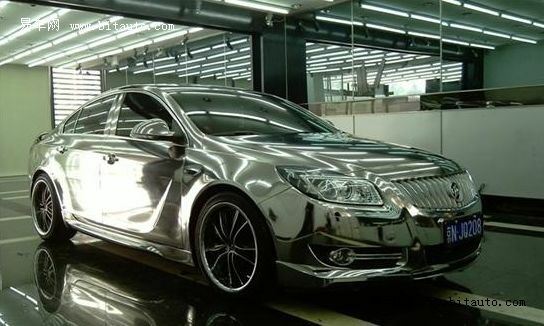 Chrome wrapping a modern Buick Regal is one way to get attention, especially in China, where the vehicle and the enthusiast club is located. And if flat black is more your thing, they’ve gone and done that, too. However, it’s not the craziest thing a Buick Regal has done. What’s your opinion on chrome cladding on a Buick Regal? Let us know in the comment section below. Why does chime get cooler fog lights than us! I kind of like it, but it would be very dangerous to drive on a sunny day. or at night w/ headlights shining. Yea, its not that bad, not very practical but it will make any ride stand out on the road, and I think the flat black on the regal with those wheels makes it look pretty sinister. more money than brians, useless waste of time! I think the company that’s doing the 1:18 scale die-cast replicas of the 2011 Buick Regals should do a series of them in chrome.